The Sharks will be out to extend their lead at the top of the South African conference in Super Rugby as they take on the desperate Jaguares in Round 9. Join The Roar for live scores from 11:05pm (AEDT). The Sharks, back at home after a surprising victory on the road over the Lions last week are sitting at the top of the South African conference and have been in a ruthless mood. Their forwards have been laying an outstanding platform for the Durban-based side to operate off, and it showed last week as they dominated the 2018 grand finalists in Johannesburg. The victory was a surprising as it was outstanding, with the Sharks going from start to finish in a 42-5 rout of the former South African champions. Interestingly, their record is only four and three, and consistency has been lacking a little these past few weeks, but this bodes as a good chance for the franchise to build some momentum and put the hammer down. 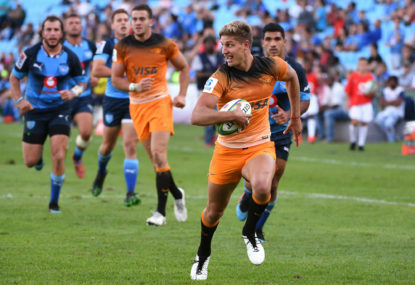 On the other side of the coin, the Jaguares have struggled in patches for consistency this season – that there can be no question of – and yet, they are only one win off the pace. Bonus points have crueled the Argentinian club though, and in total, they are seven points off the pace being set for a guaranteed finals berth, making this game absolutely crucial for the franchise. A tight two-point win over the Bulls on the road last weekend was much-needed, given it followed a pair of losses to the Chiefs and Stormers. The victory over the Bulls was less than convincing, but keeps their finals push alive, and if they can discover a run of form like that of late 2018, then there is no reason they won’t play finals rugby – but that push has to start here. The Sharks are charging straight for finals action at the top of the South African conference and should extend their lead here on home soil, putting the Jaguares further behind at the back of the line. Be sure to join The Roar for live scores of this match from 11:05pm (AEDT) and don’t forget to add a comment in the section below.